The first volume of the definitive history of Martin Luther King, Jr., and the civil rights movement – a struggle that was to change American forever. In Parting The Waters, Taylor Branch has created an unparalleled epic of America in the midst of change, poised on the threshold of its most explosive era. Here is a vivid, panoramic portrait of America divided, at war with itself, and finally transformed by a struggle that left no citizen untouched – the civil rights movement, led by Dr. Martin Luther King, Jr., borne by the spirit of a generation of young black leaders determined to seize equality and justice. 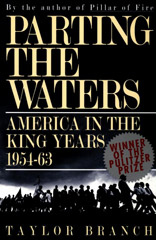 In Parting the Waters, Branch chronicles the struggle, from the twilight of the Eisenhower years through King’s fiery political baptism, the ascension of John F. Kennedy, and ultimately, the dawning of the New South. Moving from the black churches where the movement began in anthems, sermons, and prayers to Washington, where the Kennedy brothers weighed the demands of a down-trodden people against the volatile realities of politics, Branch weaves a tapestry of exciting stories: the Montgomery bus boycott, the Freedom Rides, the siege of Birmingham, the lunch-counter sit-ins, the church bombings, and – as the movement reached its apex – the tragedy of Kennedy’s assassination. From the campuses and courthouses where the battles raged to the White House rooms where the President’s men struck deals, Branch brings an astonishing gallery of characters to life. He provides revealing, unsurpassed portraits of King, scion of the black bourgeoisie, gravitating between conscience and temptation; John and Robert Kennedy, pragmatic politicians united by ambition; and J. Edgar Hoover, who harassed the blacks with secret wiretaps and trumped-up charges of communism and manipulated Kennedy with his knowledge of the President’ most intimate secrets. Monumental in scope and impact, massively researched yet compulsively readable, Parting the Waters is a masterpiece of American history. To be followed by a second volume, Pillar of Fire, spanning the Lyndon B. Johnson years (1963-1969), it will endure for generations as the essential record of Martin Luther King and the civil rights movement.